Offering you a complete choice of products which include fully automatic double column band saw machine, fully automatic high metal cutting machine, metal cutting fully automatic band saw machine and fully automatic bandsaw machine. 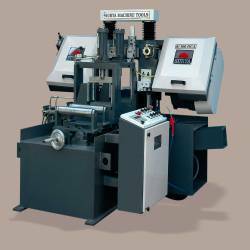 e are a leading manufacturer and supplier of Fully Automatic Double Column Band Saw Machine. 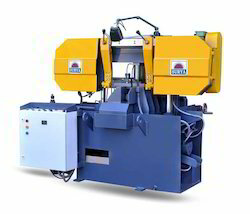 The offered band saw machine has specialized design by a team of experienced professionals with detail knowledge about the latest trends existing in the industry. Better alignment, even spacing and uniformity in deepness of the characters are the special characteristics of band saw machine which is plated to provide high resistance to rust. Widely acclaimed as an efficient and effective manufacturer and supplier, we are engaged in offering Fully Automatic High Metal Cutting Machine. 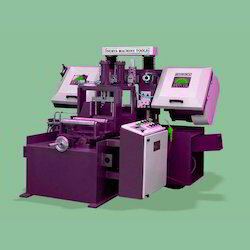 This machine can be used for cutting rough shapes out of medium sized pieces of sheet metal. This machine is highly praised for its low maintenance, less cutting taper, high cutting rate, low working height, high blade life and rear feeding of job. Blade speed 20-90 m /min. Clients can avail from us Metal Cutting Fully Automatic Band Saw Machine as we are a leading manufacturer and supplier of impact press machine. 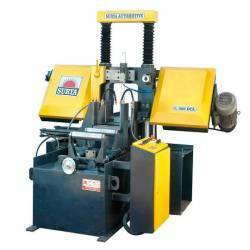 The offered band saw machine is extensively used for cutting in various shapes and known for their durability. With excellent repeatability, consistent impact, simplicity of setting up, band saw machine is very versatile as well. This band saw machine is broadly acclaimed for its high operational efficiency and functionality. Known in the industry as a prominent manufacturer and supplier, we are engaged in offering Fully Automatic Band Saw Machine. Our offered fully automatic band saw machines are used for in various industries for cutting rods such as stainless steel. We design and fabricate the entire range of automatic band saw machine by combining qualitative raw materials with the latest technology.